Your manuscript is comprised of words, and the ones you select are critical to how well you communicate with your audience. The vocabulary you select will either make or break your manuscript. A strong and varied vocabulary is an important writing tool that all writers should strive to have. We use words to communicate ideas, thoughts, and emotions. Sometimes our communication is successful, and sometimes it’s not. Your job as a writer is to select the words that communicate exactly what you mean, without the possibility of misinterpretation. A wide vocabulary allows you to do that. Without a good working knowledge of words and their meanings, your written communication will be muddied or poorly understood. If you don’t have a strong vocabulary, one way to develop it is to use a simple but effective writing tool: a thesaurus. Say you wanted to describe how you felt on the day your first child was born. You might use the word “happy.” However, we use the same word to describe a wide range of pleasant feelings, don’t we? I’m happy when I have a cup of coffee in the morning, but that’s not the same happy I felt the day my daughter was born. I highly recommend a writing tool called Visual Thesaurus. 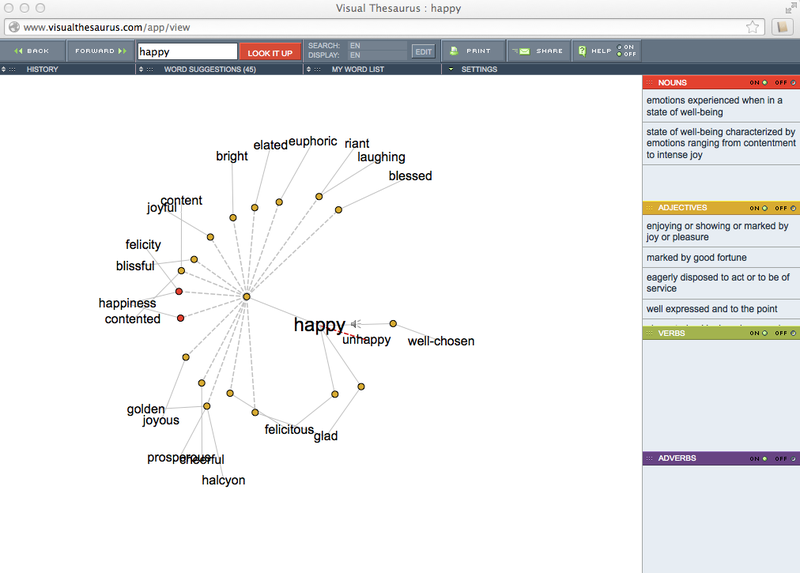 Simply type in the word you want to replace, and the results pop up in mindmap format. Click on any of the displayed word options, and they will expand to give further meaning. In essence, you drill down until you find the precise word that means exactly what you want to say. I looked up the word happy because I wanted to describe how I felt when my daughter was born. Some of the selections included blissful, joyful, content, glad, bright, elated, euphoric, etc. The term that really struck me was blessed. Next, I wanted to describe how I feel when I drink a cup of hot coffee in the morning. I don’t feel blessed, or euphoric, or bright, or gleeful, I feel content. I am content with my cup of coffee. The words blessed and content are both variations on the word happy, and yet, they actually have different meanings. A nimble working vocabulary allows you to say exactly what you mean and to be explicit, rather than vague. I caution you to choose words that your audience will understand. In other words, keep it simple. If the reader doesn’t understand your word choice, you may feel intelligent, but you will lose your audience, and that’s not good communication. A thesaurus is an excellent writing tool because it helps you brainstorm and then drill down to the perfect word, but you do not want your readers to need a dictionary just to get through a mess of overcomplicated words on each page. So when choosing your words, remember that you are writing to communicate your thoughts, ideas, and feelings.